The Union Cycliste Internationale (UCI) cut the Tour of Beijing from its 2015 WorldTour calendar and ended its four-year Chinese experiment with mixed results. UCI president Brian Cookson spoke at the 2014 Road World Championships in Spain yesterday, saying that there was a “new and exciting era” with the planned reforms for 2017, but gave Beijing no place on the calendar. When Cookson took over the presidency last year, the writing appeared on the wall for the five-day stage race around the capital city and its northern countryside because of its ties to former president Pat McQuaid. McQuaid began the Global Cycling Promotion (GCP), a race organising arm of the UCI in charge of the Tour of Beijing, as a way of putting money in the organisation’s bank account. The GCP introduced the race in 2011, the wake of the 2008 Beijing Olympics, and tried to create similar stage races in Hangzhou, the country’s southeast, and in Russia. Those races never got going and the Tour of Beijing appeared doomed when Cookson started campaigning. At a visit last year in Beijing, he and GCP Director Alain Rumpf appeared uncomfortable sitting in the same press conference together talking about the race. Cookson had written in his election manifesto that the GCP’s “operations and status are unclear even to those within the UCI” and that, given its part of the UCI, it creates possible conflicts of interest with other race promoters. Tony Martin won twice in 2011 and 2012, and Beñat Intxausti (Movistar) won in 2013, but roadside fans were always limited in numbers. The 2014 edition, runs from October 10 to 14, and marks the last WorldTour race on the calendar. However, instead of parachuting in a top-level stage race in 2015, the UCI wants to develop cycling at grass-roots level. “It’s not only about the elite level,” Cookson at the 2013 Tour of Beijing. “One of the things I said in my campaign, it’s not just enough to parachute in with a European pro model. You have to develop cycling in those countries in a way that’s appropriate to them and that maximises the benefits for everybody. “China has had great track riders, I know there’s a large number of covered velodromes… There’s a huge potential here. One of the things we did in Great Britain was to target the track in the Olympics because there are far more medals to be won on the track than the road. 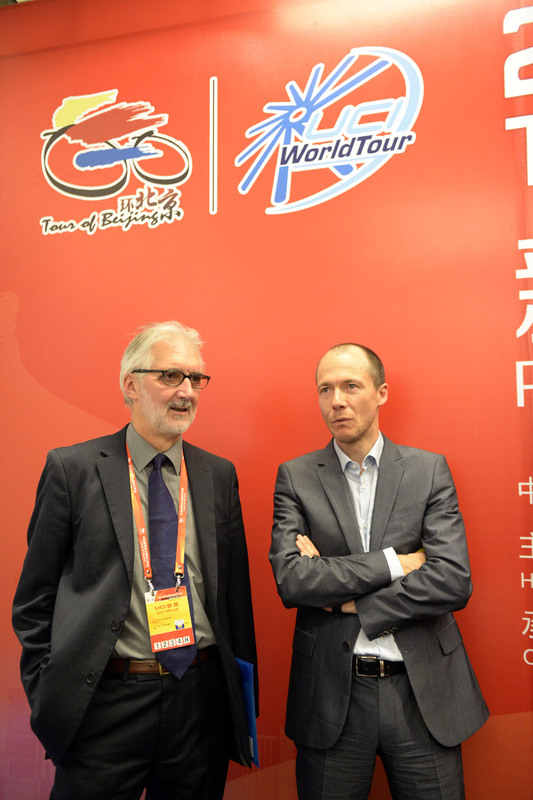 With the Tour of Beijing in the bin, the UCI is left with only the World Championships to organise. The 2014 edition started on Sunday in Ponferrada, in Spain’s northwest. UCI president Brian Cookson says ending of race after four years is "not a disaster".